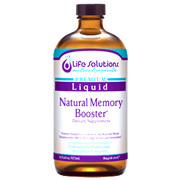 Liquid Natural Memory Booster provides an effective way to improve memory and mental function. Contains a standardized ginkgo extract as well as a potent rosemary leaf extract for antioxidant activity. B vitamins are included for additional brain support. other ingredients: Purified Water, Crystalline Fructose, Natural Vegetable Glycerin, Natural Flavor Blend and/or other natural juice concenterates and natural flavors, Citric Acid,Xanthan Gum, Potassium Sorbate (to preserve freshness), Luo Han Guo Fruit Concenterate. Natural Memory Booster - is shipped in a discrete, unmarked package. Orders are processed immediately and usually take about 3 to 5 working days to be received. We do ask that you try it for 2 to 3 weeks to feel the full effects. Any information received is used only for order processing and shipping purposes. Your information, such as e-mail address, will never be disclosed to a third party.